Gun safety is a Jewish issue. Since the shooting at Sandy Hook Elementary in Newtown, Connecticut, Jews have played a prominent role in advocating for gun safety. There are, to be fair, Jews on the other side of this debate and some in between. Nevertheless, a compelling case for sensible legislation aimed at reducing gun violence can be framed from the Jewish tradition. The Torah urges us to conduct ourselves scrupulously and safely (Deut. 4:9: “Take utmost care and watch yourself scrupulously”) and commands a homeowner to build a railing around the roof “lest you bring bloodguilt upon your house if anyone should fall from it” (Deut. 22:8). From this precept the Rabbis concluded that a person should not keep wild dogs, shoddy ladders, or other dangerous objects in the home lest they cause bloodshed (Babylonian Talmud (BT), Bava Kamma 15b). “Jews ought to be in the vanguard of those seeking to impress upon our legislators that handguns are indeed ‘stumbling blocks’ which must not fall into the hands of the ‘blind.’” (“Should Jews Sell Guns?”, referencing Leviticus 19:14, “You must not insult the deaf, nor place a stumbling block before the blind.”). Our Movement must continue to lead the way on this issue. 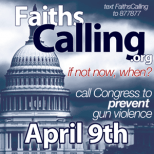 In February, the RAC (Religious Action Center) helped organized an interfaith call-in; thousands of people of all different faith traditions picked up the phone to put religious pressure on our legislators, and another such day is being organized for April 9th. The URJ seeks partnership with Pastor Rick Warren; they also got Mike Bloomberg to promote the message for NFTY. What might sensible gun safety legislation look like? One. Universal Background Checks should be utilized in every gun sale, including guns sold online, at gun shows, and through private sales. Two. 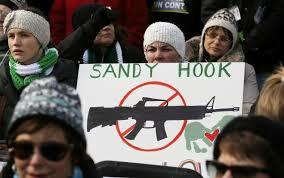 Ban the Sale of High-Capacity Weapons and Ammo Clips to Civilians. No legitimate self-defense or sporting purpose exists for these military-style, high-capacity weapons and magazines. Three. Gun Trafficking Should Be Made a Federal Crime. Currently, prosecutions only happen through a law that prohibits selling guns without a federal license, which carries the same punishment as trafficking chicken or livestock. Existing laws must be enforced more effectively, and new laws–with harsher consequences–drawn up to criminalize gun trafficking. We would like our legislators to propose a (remarkably!) modest limit to the number of gun purchases to one gun per person per month. We should also work Movement-wide and with partners within and without the Jewish community to initiate direct discussion with key players in the firearms industry, meeting with manufacturers and distributors to request their adoption of responsible practices: imprinting firearms with Firearms Identification Numbers; researching new technologies such as “smart guns” (guns that only owners can fire); and video recording all gun purchases at the point of sale. By 2015, it is projected that annual deaths by gun in America will exceed traffic fatalities for the first time in history, at around 33,000. That’s more than ten times the victims of 9/11, each year for the conceivable future, unless we stand together and demand change. Gun violence has besmirched not only the honor of our country, but also the honor of responsible gun owners. The intransigence of a politically influential minority has impeded our ability to save thousands of lives each year with just a few common-sense measures–measures favored by a majority of Americans. To be a Jew is to hope. To lead a community of faith is a hedge against despair. And to champion the cause of Reform is to believe that change is never impossible. I for one still hold aloft the Divine promise of the Prophet Micah, of a day when each of us “shall sit beneath vine and fig-tree, with none to make us afraid” (Micah 4:4). Rabbi Jonathan Blake serves Westchester Reform Temple in Scarsdale, NY. Well said. Thank you Jonathan. Today is a day to applaud Connecticut for their new laws. That leaves so very much yet to be accomplished. I don’ agree with Rabbi Blake. If our parents (for me) or grandparents (for most of you) would have had unregistered guns in the thirties and forties, fewer people in our families would have perished in that Jewel of Democracy called Germany. The second amendment and the history around its promulgation shows quite clearly that it was meant to be a restraint on run away government, and the dictatorship of the better armed. We should not sell weapons to anyone who might use them improperly, and we should not keep track of who owns them after they are sold. Any system that strays from those two principles is unacceptable to those who have studied the history of the Jews and know how many of them died because they could not believe that it could happen here! So I am for registering those who are mentally unstable, have been in jail, etc., and I am for checking whether anyone buying a gun is on that list. How that would be enforced in private sales I do not know, but I am against restricting people’s rights to do what they want with good they own. I have more faith in my fellow men than some, and fear the government more than others. You cannot enforce one gun per person per months without a gun registry, so I hope that never happens. Guns do not besmirch anything, neither do hammers which I am told kill more people than assault rifles. I concur with Mica that we wish and hope for the day when each of us “shall sit beneath vine and fig tree, with none to make us afraid”! Until then, I want to be able to own a gun and defend myself.